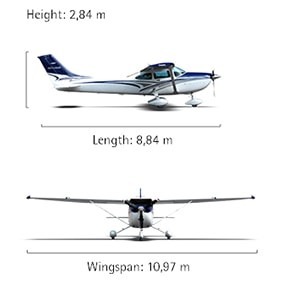 Versatility and a high degree of operational efficiency are some of the factors that make the 182T Skylane a unique aircraft. This best-selling model perfectly meets the most diverse needs, whether for work or for general use on the weekends. In addition to carrying a lot of cargo, the aircraft even operates on short and uneven runways, perfect for the most diverse missions, including those involving agribusiness. In addition to the warranty by Cessna, the world's largest general aircraft manufacturer, the model is equipped with state-of-the-art technology, which enables many features to be more intuitive, significantly reducing the pilot's workload and increasing the level of safety of the operation. With a 230 HP Lycoming engine and with traditional Cessna quality, this aircraft is synonymous with reliability. It has a panel with Garmin G1000 NXi avionics, some of the most modern equipment for aircraft panels. The model has a classic touch, like the high wings, which improve the visibility of the flight. The model offers an excellent use of the interior space of the cabin, providing even more comfort to passengers and crew.